Contact Advanced Fluid Systems for your hydraulic repair(s). We can repair just about every product or system used in the hydraulics/pneumatics industry. OEM supported and highly trained repair facility. We will conduct a no-risk evaluation of your equipment. We’ll prepare a quote for the recommended repair and or replacement options. Upon receipt of your written approval, we will begin the repair process. Each repair is fully tested to the manufacturer’s specifications and includes a one-year limited warranty and a two-year limited warranty on Moog products. Note: For Moog components and hydraulic repairs, please contact us for a return number and additional instructions. Advanced Fluid Systems’ York facility has a 14,000 sq./ft. area dedicated to our repair, manufacturing and field services which includes a 20-ton overhead crane and dedicated clean room for testing. Hydraulic cylinders are economical to repair and we repair some of the largest. Our new cylinder repair station accommodates units to 16 inches in bore and 240 inches in stroke. Don't know the manufacturer? We can custom manufacture rods, seals and other components to repair any hydraulic or pnuematic cylinder to "like new" condition. All brands and styles of hydraulic and pneumatic cylinders and rams. Cylinders up to 16 inches in bore and 240 inches in stroke. Custom rod ends, chroming and finishing services are available. Call for expedite and quick delivery options. 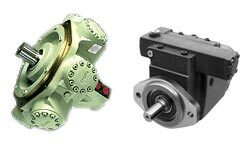 We repair every style of hydraulic pump and motor, from gear pumps to the largest radial piston pumps, regardless of brand. Our inventory includes seals, parts and remanufactured pumps available for immediate shipment. Most quotations are free of charge / no obligation (call for details). Authorized service center for Atos, Oilgear, Linde, Moog and more. Factory Warranty and service center for Oilgear. 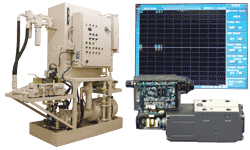 Dedicated test stands thoroughly test each repair to manufacturer's specifications. Contact us for expedite and quick delivery options. Repairing proportional and servo valves requires experience and the correct tools to properly test and recalibrate these precision valves. Our new digital test stand helps us to maintain the strict controls and testing that these valves require. 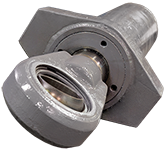 Send your valve in for evaluation and see why these are one of the most economical components to have repaired. •All valve sizes and electronic controls. Digital test stand for precise calibration and testing. Valves are set and calibrated to your specifications for plug-and-play installation. Hydraulic Servo Valve Repair page. Some other components we repair include miscellaneous valves and accumulators. We service mobile and industrial directional control valves for both pneumatic and hydraulic applications, as well as pressure control, flow control and load control valves. Bladder and piston accumulator services include complete repair, cleaning and charging. 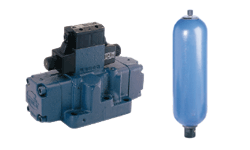 Hydraulic and pneumatic directional valves. Custom settings for pressure and flow control valves. Hydraulic Valve and Accumulator Repair page.